Since 1926, Magtech has manufactured its own components, bringing their customers full quality control over every stage of the manufacturing process as well as the final product. 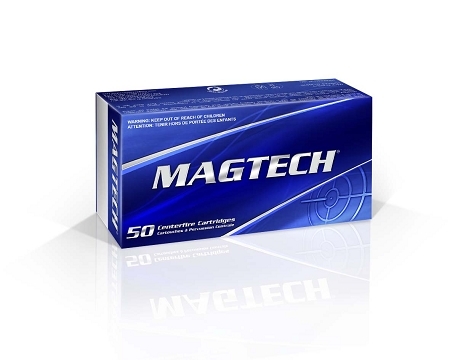 The Magtech brand name is commercially recognized internationally and sold in more than 50 countries worldwide. Magtech's main objective is to provide shooting enthusiasts with absolutely reliable, totally affordable ammunition, round after round. Magtech ammunition is designed, constructed, and tested in one of the largest and most modern small arms manufacturing facilities in the world. Only the highest quality materials, cutting-edge manufacturing techniques, and state-of-the-art equipment are used to deliver exceptional standards. Sport ammunition was designed for shooters looking for accuracy, reliability and exceptional performance, round after round. This ammunition is the choice of top competitive shooters like Jerry Miculek and Mark Hanish among others. This ammunition is new production, non-corrosive, in boxer primed, reloadable brass cases. We do NOT accept any returns on ammunition.